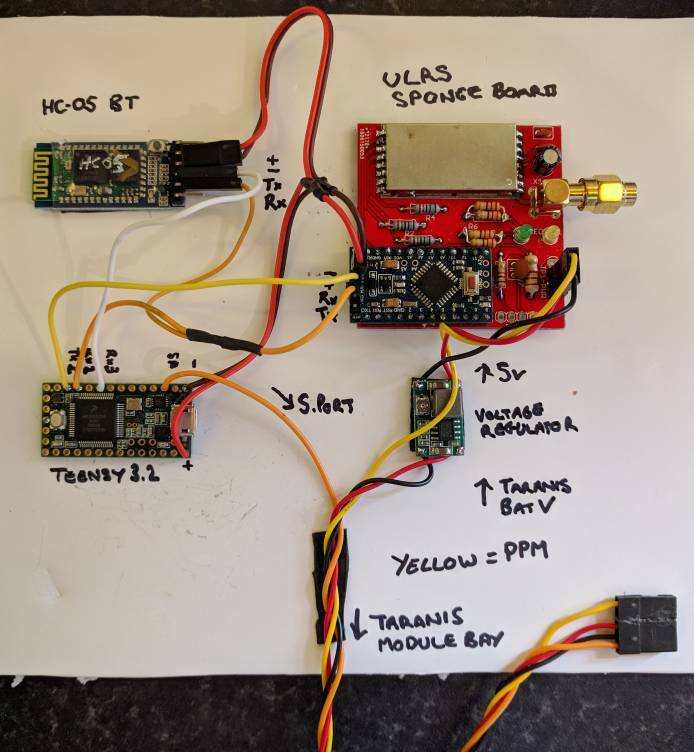 This thread was created for anyone building or planning to build the Mavlink To Frsky Passthru converter. unaware of a suitable solution to convert to the Passthrough protocol. inverter). The Mavlink procol telemetry can still be fed on to Mission Planner or other GCSs. on a 'plane, and as the number of sensors grew over time so too did the telemetry requirements. 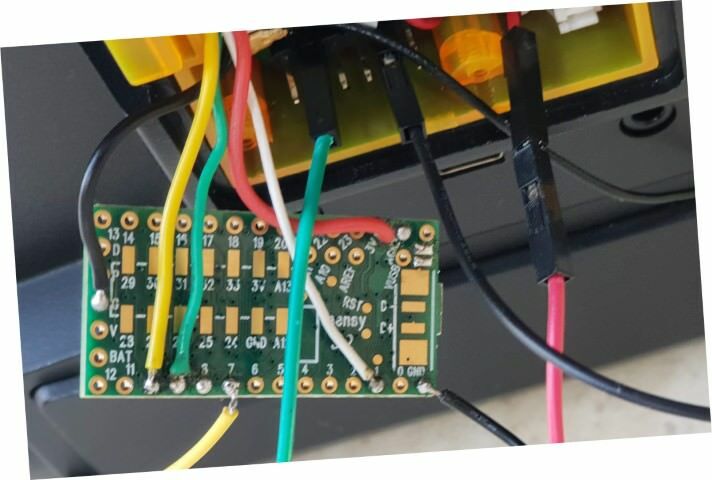 Synchronous sensor polling is central to the telemetry, and timing is critical. frames and sent asynchronously (whenever you like). polling. (It pretends to be a receiver for polling purposes). Un-comment this line #define Ground_Mode like this. to Taranis on the ground. 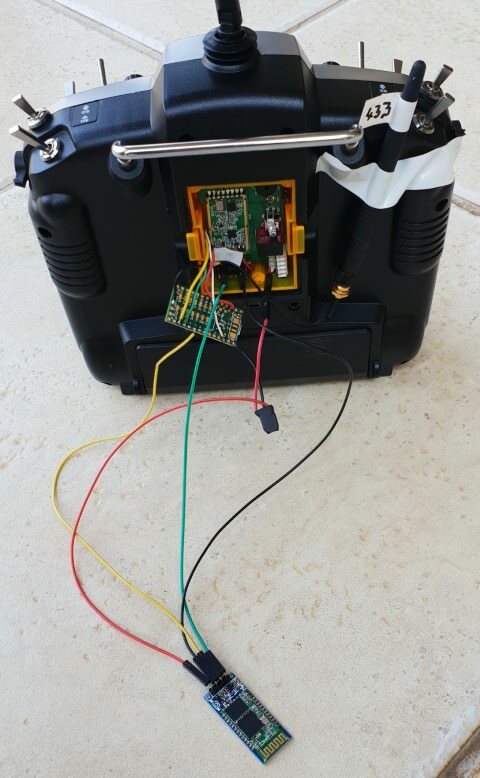 In this situation it responds to the FrSky receiver's sensor polling. 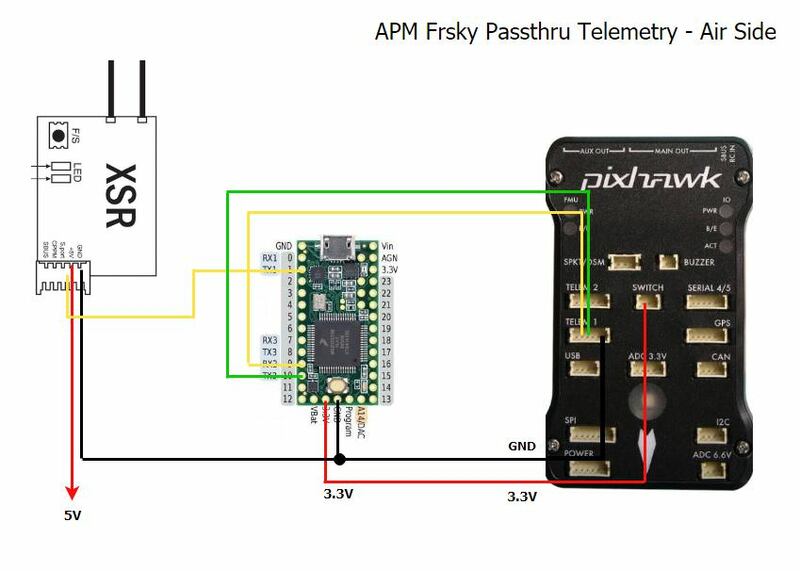 The APM firmware can deliver passthru telemetry, but the PX4 Pro firmware cannot. script supports the entering of battery capacities for each model. The little black blob on the red wire from the Taranis 8.4v supply is a small 7805 linear regulator to feed 5v to the HC-06. Last edited by zs6buj; Feb 22, 2019 at 09:34 AM. So glad you created this thread. Brilliant project. 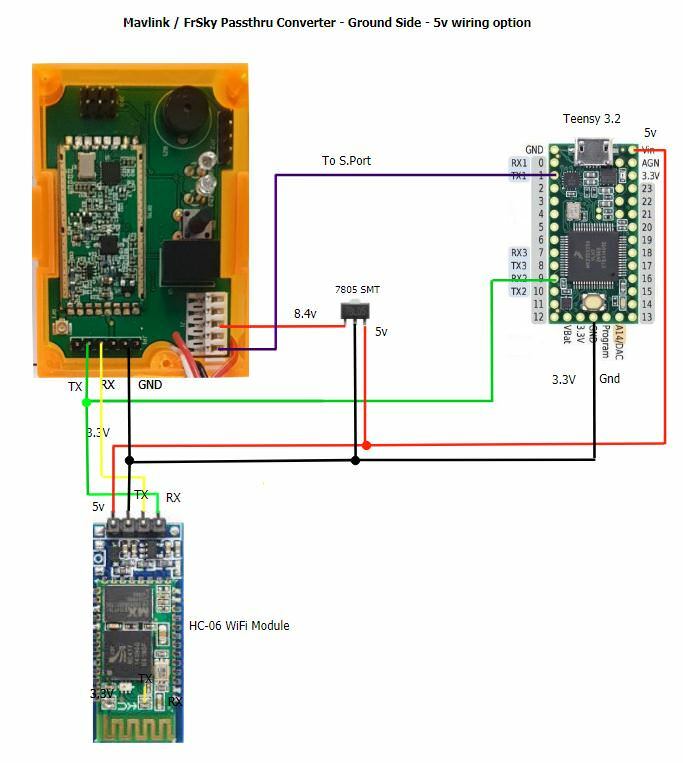 I have posted in the DL thread to request the simple firmware mod required so all Dragon Link v3 users can use your project. Can this work passively using only the TX line? I understand that you are also grabbing the battery capacity from the autopilot. Is this why we need to connect to the RX so we can communicate with the autopilot? Can this value be input directly into the LUA on the LUA setup screen. Last edited by Marc Dornan; Jun 07, 2018 at 10:32 AM. Hi Marc, thanks for the kind words. Yes you can use the TX in passive mode, and yes I use Teensy TX to Orange RX to request battery capacity parameters. Yes, the mAh can be input directly into the LUA. Is this the same protocol that the Craft&Theory code runs against? I hope I can do this answer justice! The passthru protocol is indeed the same one that was developed by C&T. 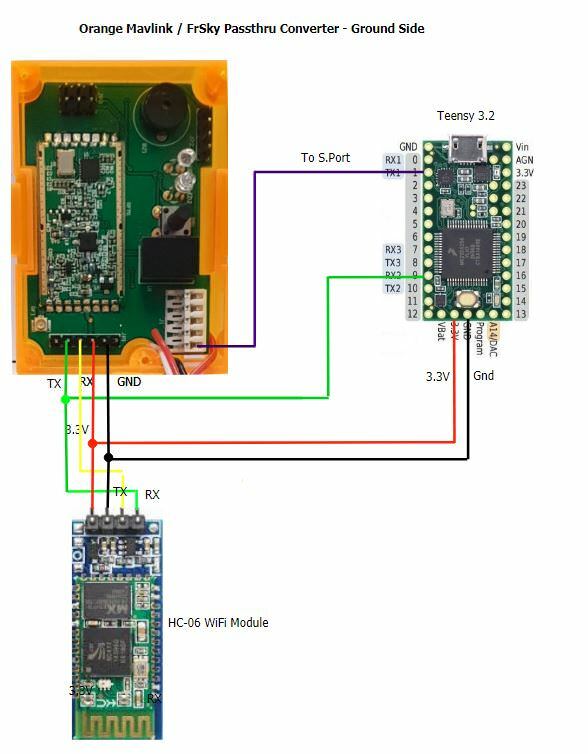 It is actually integrated within the Ardupilot code now, and also inside the LUA interpreter of OpenTx 2.2, such that by setting SERIALx_PROTOCOL = 10 will output the FrSky passthru protocol from the chosen (x) serial port on the flight controller running AP, and if connected to the smartport of X series Frsky Rx, ends up on the Taranis/Horus, accessible via a suitable LUA telemetry script - such as either the C&T script, or the free one in the OP by yaapu - its pretty awesome! (not tested this on the C&T script myself - maybe someone else can chime in if they have? 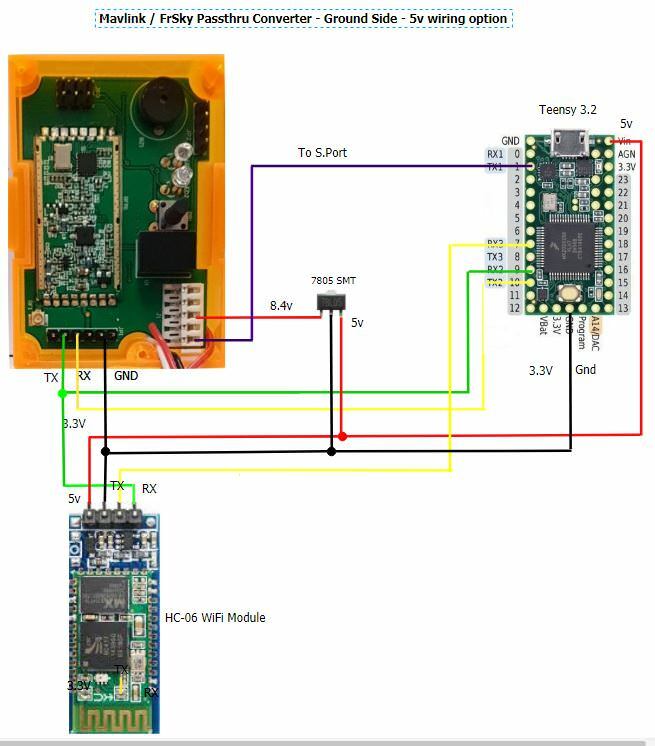 The difference between this project's implementation and the C&T code in Ardupilot, is that this one converts a standard Mavlink telemetry stream to FrSky passthru protocol, whereas the C&T code in Ardupilot accesses its data from not just Mavlink but also from other sources within the ardupilot code directly before it reaches Mavlink - so theoretically it has more scope for data access. The beauty of this project however is that it takes the conversion process to the external teensy module, which if placed airside, it allows the PX4 flight stack to produce Frsky passthru (which it doesn't currently support), and more importantly (for me at least) it allows ground side placement of the teensy on my ULRS system, meaning I can pass down the regular mavlink 1 data stream from Ardupilot, over the ULRS serial port, feeding this into the teensy ground side, resulting in both mavlink and passthru protocol access at the ground station - passthru to the Taranis LUA screen, and Mavlink via Bluetooth for Mission Planner/QGroundControl etc on a laptop. So its a great solution providing a lot of scope! I built it as a ground mode version, with Emulation_Enabled, and NOT Aux_Port_Enabled. Which board are you using for this chip? Perhaps an old flight controller? Reduce, reuse, recycle. If by that you mean Dragonlink, I tried passing FrSky Passthrough using the RS232<->TTL adapter w/ no luck. Looking at the Craft&Theory adapters, it appears that they are using these exact components also! 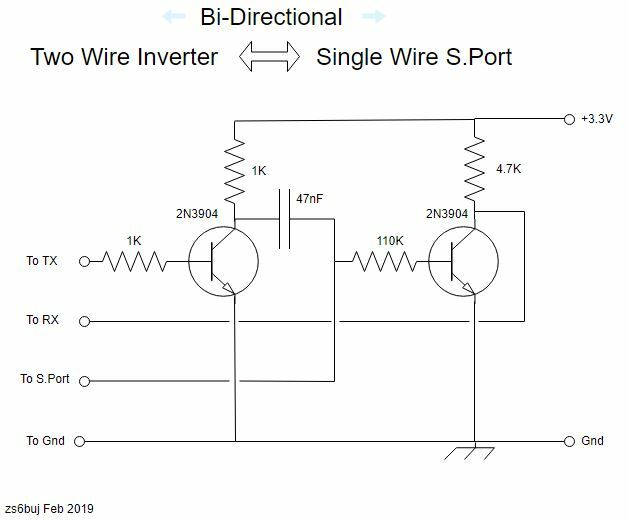 I use these regularly in RC (in place of your 7805 regulator) it supplies up to 3A with variable voltage (just dial in what you need on a tiny pot, then drop a dod of CA on it to fix it from changing). Find it great in place of a BEC also as good enough to power Rx and a couple of 9g servos (usually dial in just under 6v for this), for say a small flying wing. urlu75 has requested support for a Relay Mode. 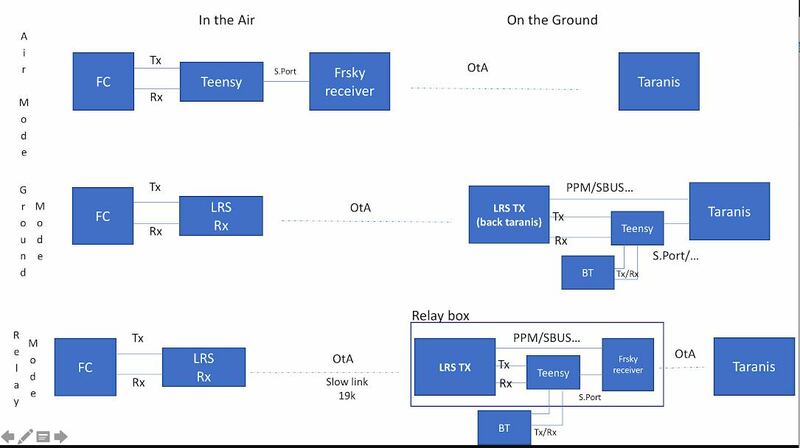 I recall reading about athertop proposing a "repeater station" here along the same lines. Last edited by zs6buj; Jun 12, 2018 at 04:04 AM. Hoping this might help someone with wiring. My test bed.